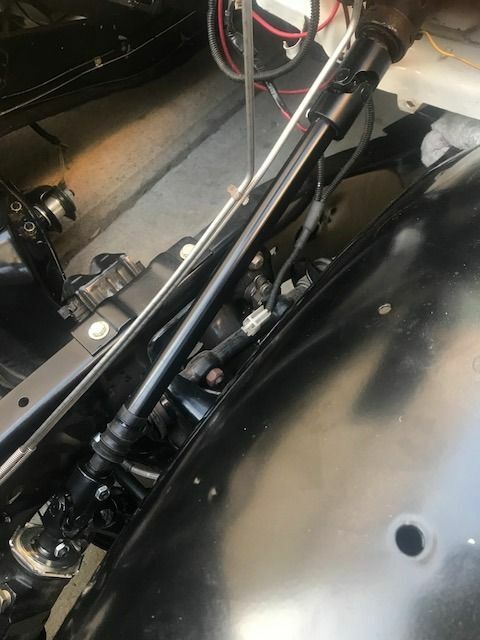 Collapsible Steering Shaft - Disassemble? So I'm mid-resto on my 77 and I pull the steering shaft to powdercoat since it's unsightly. I had a hell of a time getting it off. Normally the mid section of a steering shaft will collapse as soon as you unbolt the shaft from the steering gear. That being said, I was able to melt off those little plastic retainers inside the two shaft halves and disassemble everything. I was told this was a no-no and now that the plastic retainers are gone, there would be steering slop? I find this hard to believe considering the shaft halves are very tight slip fit. Anyone have any ideas since I've already taken it apart? 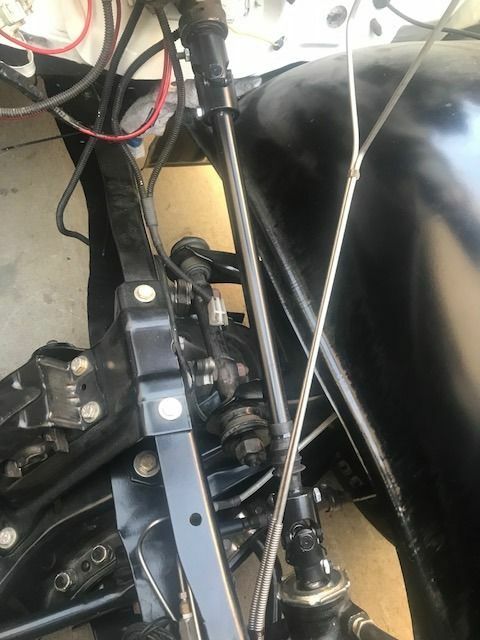 Re: Collapsible Steering Shaft - Disassemble? It has been MY EXPERIENCE that once the two shafts slide on the plastic inserts that the two shafts will have slop in them. Your mileage may vary, good luck. There will not be any sliding once it is assembled. It will be fixed at the firewall and at the rag joint. Nothing to move till you rear end that beer truck. Drill and tap the female half and put in some set screws. Make them snug but not tight so you still have some slip in the shaft and use some red loc tite. That will take up the slop. My solution to eliminating steering slop on my '77! Borgeson shaft part # 000933. Features a 48 spline 1" unversal joint at the column, and a 30 spline 3/4" universal joint at the box. This should be correct for 73-77 trucks before they went to the metric steering gear in 1978. I did have to cut the shaft down about 6". It does state in the Borgeson instructions that on certain trucks (I assume 2WD models) that the shaft will have to be cut down some. No problemo! Then it was primered and painted satin black. Hard to say yet since the truck is not self-propelled, but steering feels infinitely better and the new shaft is a great compliment to my rebuilt Lee Power Steering box. I would try it and see how much slop it has. I was under the impression that the steering shaft was still usable even after it was collapsed in a crash. It just wouldn't be locked in the extended position. Maybe a crash just shears the plastic tabs and it's still tight whereas yours are melted out. I'm not sure how much difference that would make. and i just had a column apart . the shaft inside is also a 2 peice shaft with collapsible joint just like we have on the engine bay shaft . so dont overthink it to much . there is double safety built in to the system . What year column did you take apart? On mine once I took it apart, it was quite loose. It certainly could be reused, but I would want to throw a couple tack welds on it before I did that. It definitely wobbled around without the plastic on there. What year column did you take apart?. was a mid 80's had wiper on it not in the dash also a tilt . i would NOT tack weld anything . just 2 good nuts welded over a pair of holes . then 2 set screws in a tiny dimple each and a jamb nut on each is all you need and still will slide if hit . My solution to eliminating steering slop on my '77! Borgeson shaft part # 000933. I don't think you cut the upper female shaft enough. It has no collapse room right now. I believe the instructions said to stroke the inner DD out until it almost bottomed out then mark and cut the upper shaft.